Different from regular PM machines, flux modulation machines are with different stator and rotor pole numbers, and produce steady torque based on the so called flux modulation effect. The special operation principle makes flux modulation machines high torque density and low-pulsation torque, and more design freedoms lead to many novel machine topologies for different applications. 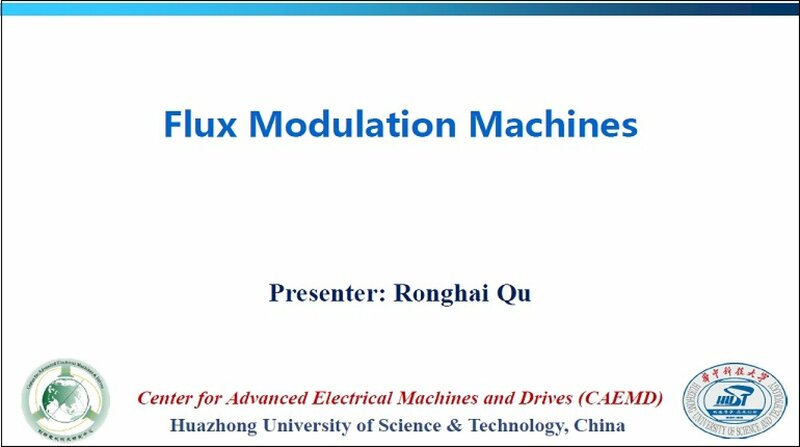 This webinar will be a summarized presentation of Flux Modulation Machines, from principle, features to topologies. After a short introduction, the Webinar will focus on machine family definition and difference with traditional machines, operation principles, and topologies. After introducing three machine major components, flux modulator, armature and excitation field, different flux modulation machine topologies will be introduced based on different rotating components. Common features will be summarized, main concerns and challenges will also be discussed. At the end, analyses, designs, and prototypes of vernier machines, a flux-modulation machine family member, will be demonstrated.